In 2005, at just four years old, Elan Galler was diagnosed with epilepsy. After watching their parents give every ounce of their time and energy to Elan, Elisha and Meital – Elan’s older siblings – wanted to help. In 2010 Meital started Hope Time Cure as her Bat Mitzvah project. Meital chose the name to represent the idea that with Hope and Time we will find a cure. She also designed the logo based off a painting she had done and raised money by selling sterling silver charms. During his senior year in high school, Elisha decided to expand Hope Time Cure into a full-fledged organization now known as the Hope Time Cure Epilepsy Foundation. He started an epilepsy education program in Jewish Day Schools in Boston. This program took place on March 26th – Epilepsy Awareness Day. After high school, Elisha spent two years in Israel learning at Yeshivat Orayta and created the Run4Purple Jerusalem marathon team in 2014. That year, the marathon team included 35 runners, some of them were Yavneh alum, and raised about $20,000. The following, year the Run4Purple team grew to 70 runners and raised about $35,000. All the proceeds went to supporting the mission of the Hope Time Cure Epilepsy Foundation – to promote epilepsy awareness, education and to provide support to individuals with epilepsy and their families. That same year a close family friend, Ezra Schwartz, was killed in a terrorist attack in Israel. Elisha grew up with Ezra. Their parents were friends before the children were even born; in fact, Elisha’s dad went to college with Ezra’s dad. They all lived in Brookline and moved to Sharon, MA around the same time. They used to ski together in Vermont and even today the connection continues – Elisha is in college with Ezra’s sister, Mollie. Devastated by the news of Ezra’s death, Elisha wanted to do something to honor Ezra’s memory. Since Ezra had planned to run on the Run4Purple team in 2016, Elisha and the Schwartz’s decided to name the marathon team in Ezra’s memory – Run4Purple, Team Ezra – so he could forever run with the team. That year, the team grew to 150 runners and raised around $135,000. 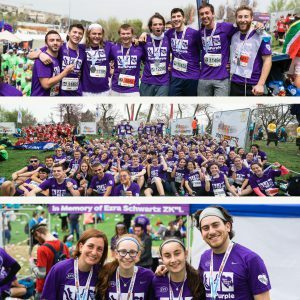 This year, in 2017, the team grew again – to 200 runners and included both the Tel Aviv and Jerusalem marathon and they raised around $140,000. Today, Elisha lives life at a marathon pace. He is a college sophomore studying economics and philosophy, works as the director of the Hope Time Cure Epilepsy Foundation and is continuing to educate and raise awareness. He recently started an online video series of people telling their own stories of epilepsy. The Hope Time Cure Foundation also supports a program called THRIVE (Together Helping Reach Individual Victories in Epilepsy) at the Massachusetts General Hospital. He hopes that one day, the Thrive program will expand to other cities. Elisha is also planning on a Run4Purple marathon run in the States this fall. While in Israel, Meital recruited this past year’s team and is excited to get back to the States and continue to work for Hope Time Cure while studying at Barnard College in New York. Overall, Elisha and Meital find their work at the Hope Time Cure Epilepsy Foundation very fulfilling and they love doing it! For more information visit http://www.hopetimecure.org.